Morganite, also known as 'pink emerald' is a perfect choice if you love using delicate pastel colours in your jewellery designs. 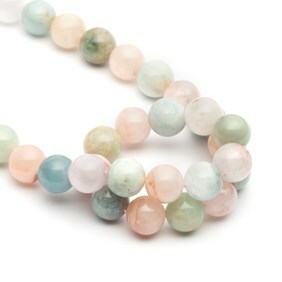 Our morganite round beads are perfect for creating soft coloured designs, great for summer makes. Morganite, also known as 'pink emerald' is a pretty, transparent gemstone to use in your handmade jewellery designs. It's a variety of beryl and has a gorgeous pinky orange colour which is caused by traces of manganese - deeper colour within morganite is rare. It measures 7.5-8 on the Mohs hardness scale. Morganite is a brilliant gemstone for jewellery making due to its hardness and durability. The soft colours and brilliance of this stone make it stand out from the rest, offering a striking yet subtle touch to your designs. Shop our range beading threads and jewellery findings to get making! Explore our beginner's jewellery making kits with step by step instructions for inspiration or check out our jewellery making tutorials on silversmithing, wire-wrapping, beading, stone setting, texturing and more. 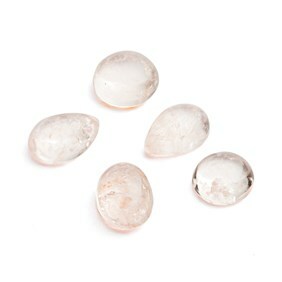 Morganite is said to bring compassion, love and promise.